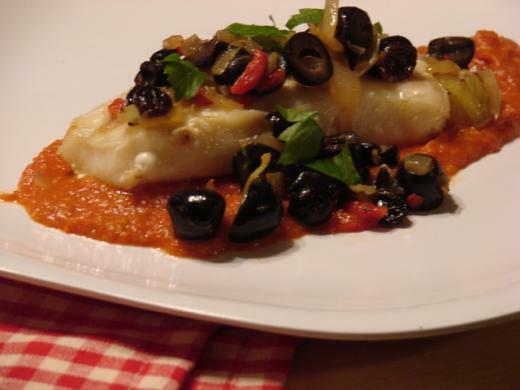 This recipe is a family favourite, and it’s all about making the fish the star of the meal. A delicate poach in olive oil cooks the fish to perfection!!! This easy recipe is a beautiful feast that can be served on any occasion but is perfect for the feast of Good Friday. In a large, deep nonstick skillet, heat olive oil over medium heat. When oil is hot, add onions. Cook, stirring, about 3-4 minutes or until soft and tender. Reduce heat to medium-low. Stir in olives, rosemary, garlic and peperoncino chilli flakes. Cook, stirring occasionally, for a few minutes to develop flavour. Add the passata and lemon zest and season with salt and pepper, stir well. Remove from heat. In a large deep skillet, pour olive oil to cover bottom of skillet and about 1/2 inch up the sides of the skillet or equal to the same thickness of the fish fillets. Heat oil over medium-low heat until oil is warm. Season fish fillets with salt and pepper, to taste, on both sides. Gently place fish fillets in a single layer in the skillet. Poach fish fillets until they turn white, about 8-10 minutes. Flip fish, continue poaching, until fish is completely cooked through and flakes easily, about 3-4 minutes longer.